How do you improve data center power efficiency without impacting IT performance? HPE Flexible Slot Power Supplies provide up to 96% power efficiency with 80Plus Titanium-certified power supplies that lower server power requirements and reduce power waste in your data center. This form factor is 25% smaller than previous generation power supplies, providing more space to add additional server options and improve the performance of your servers. 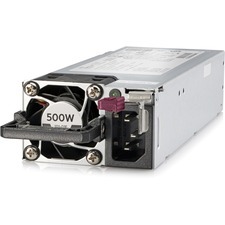 These power supplies provide fast, tool-less hot plug access to server power supplies for greater serviceability and are supported across the entire HPE ProLiant Gen10 and HPE ProLiant 300 Series Gen9 Server families, simplifying your spares strategy and further reducing data center costs. Increase power density with 1600W Platinum power supply. Launching 800W Flex Slot power supply with 96% efficiency, 80PLUS Titanium certified. Delivering 48V DC input option in the HPE Flex Slot Power Supply form factor. HPE Flexible Slot Power Supplies provide up to 96% power efficiency with 80Plus Platinum-certified power supplies that lower server power requirements and reduce power waste in your data center. Supported across all HPE ProLiant Gen10 Server Series and HPE ProLiant 300 Series Gen9 Servers, simplifying your spares strategy and reducing data center costs.